Greenworks Pro has had the very popular Greenworks Pro GBL80300 80-volt 125 MPH 500 CFM battery powered leaf blower on the market for a few years. It has been our favorite for two years in a row. 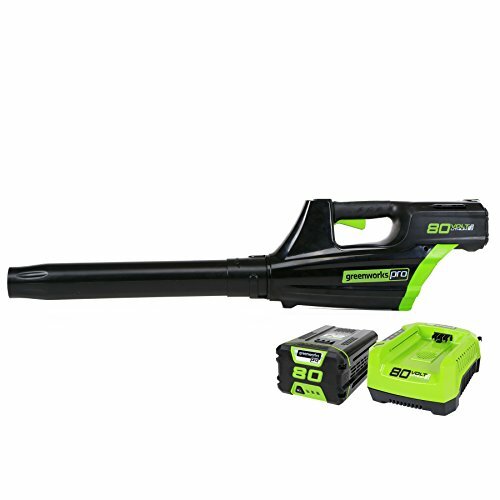 Greenworks Pro retooled their 60-volt version outfitting it with an 80-volt battery and created the Greenworks Pro BL80L2510, rated at 145 MPH and 580 CFM, which appears on paper to be a faster and more powerful leaf blower. But how much faster, and is it worth the higher price? And do other design issues make it a better model? On paper, the Greenworks Pro BL80L2510 has 16% more airspeed (MPH) and force (CFM) at the highest setting than the Greenworks Pro GBL80300. It also comes with a larger capacity battery at 2.5Ah whereas the Greenworks Pro GBL80300 unit comes with a 2Ah battery. Since they tout 22 minutes of run-time at constant full power for the new unit, the Greenworks Pro BL80L2510 may need the extra Amp hours to achieve that amount of run-time. And we feel 20 minutes of run-time is a minimum. To pack in this extra power, the new unit is also heavier by about 1 lb. The older Greenworks Pro GBL80300 model has a 3-speed switch and the new model has a variable speed trigger. The trigger could add to fatigue if you are always managing your grip for the speed you want. But Greenworks added a speed lock they call Cruise Control to the new Greenworks Pro BL80L2510 model so you can maintain your chosen speed without needing to continue to hold the trigger. Both of these units have impressive MPH and CFM ratings that are comparable to professional gas powered handheld leaf blowers. They both are powered by 80-volt systems. We have found better results in battery powered leaf blowers with a higher voltage. They both have similar run-times, same optional batteries, and compatible tools. And they are both a part of an excellent family of battery powered yard tools. The use of a common battery can reduce your costs by allowing you to share it with several tools. There are essentially 4 things different about the two units. Speed and force, weight, power control, and price. The newer Greenworks Pro BL80L2510 unit definitely has 16% more airspeed (MPH) and force (CFM). But we’ve found the Greenworks Pro GBL80300 to be quite powerful and sufficient to manage tough jobs around the house. The new unit is about a pound heavier which can add to fatigue but we found that to be a minor issue. We found the 3-speed choices of the older model to work well. We didn’t find much need to vary the speed any more than 3 choices. Finally, the Greenworks Pro BL80L2510 unit is more expensive. We think the Greenworks Pro GBL80300 125 MPH – 500 CFM has the best value for the price. But this comes down to a nuanced decision. If you want that 16% extra power, and prefer a trigger design, and don’t mind the extra money, the Greenworks Pro BL80L2510 145 MPH 580 CFM is a better choice for you. 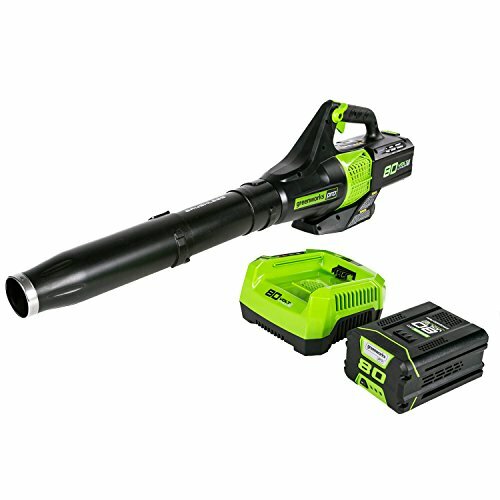 The Greenworks Pro 80 GBL80300 80-volt 500 CFM leaf blower and the Ego Power+ 4801 56-volt 480 CFM blower are two of our best battery powered leaf blowers. In this post, we compare them head to head. The Greenworks Pro has a higher MPH and a higher CFM which means it will blow air with more velocity and with more force than the Ego Power+. The Greenworks Pro blower also has a higher voltage system and we usually see longer run-times as a result. The Ego Power+ only has a 10-minute run-time at full force whereas the Greenworks Pro can go 20-minutes. Run-time is one of the most difficult measures to gauge due to numerous variables such as running at a low or high power setting and for how long. Yet reports in the field suggest the Greenworks Pro has a better range of run-time. Many of the cordless tool manufacturers have designed sets of tools that use the same compatible battery. A common battery can reduce your costs by allowing you to share it with several tools commonly used in the yard. These two companies have an excellent list of compatible tools for the yard. The Greenworks Pro unit is the clear winner in this head to head. If you already have some Ego Power+ volt tools using the 56-volt system, you may want to buy that unit. Otherwise we think the Greenworks Pro is the better choice.